After disrupting the tablet market with its Android-based Kindle Fire slates, Amazon is now getting ready to enter the smartphone market, too. The company’s very first smartphone should be officially announced in June - or at least that’s what the latest reports are indicating. We saw a few images of the Amazon handset in April, but those showed the device covered in a protective case. Well, now the smartphone appeared in a new image, and this time we can take a very good look at it. The authenticity of this new image - the one seen above - was reportedly verified by “multiple sources” that talked to BGR. It’s said that the image is being used internally by Amazon’s graphic designers. While there’s nothing stunning (or original) about the way that the handset looks, we think that Amazon did a pretty good job designing it - although that hardware home button might not be to everyone’s taste. Specs-wise, the first Amazon smartphone should offer a 4.7-inch 720p display, 2GB of RAM, a quad-core Qualcomm Snapdragon processor, and a 13MP rear camera (which seemingly has an LED flash). The handset should use a customized version of Google’s Android, reportedly coming with a 3D UI, and unique tilt-based gestures. Four infra-red camera sensors found at the corners of the device’s front will allow the software to modify the 3D UI based on users' position. Amazon may start selling its smartphone in September, possibly offering a Prime Data plan with it. The handset’s price isn’t known at the moment, but we don’t think it will be too high anyway. 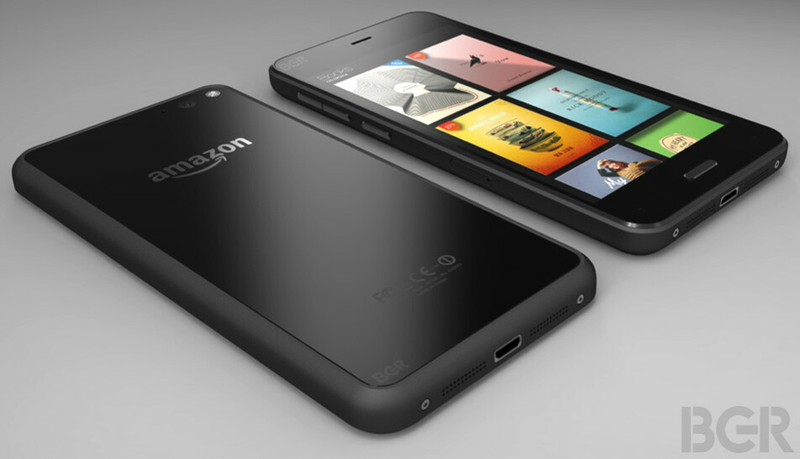 It is believed that the Amazon smartphone will be available only in the US - at least for the beginning. You can let us know if you like what you’re seeing thus far in the comments below. I'm not asking for a bezel-less phone. I wouldn't want that - glass edge-to-edge would just mean a higher chance of the screen shattering. I just want proportions to be reasonable. Making a phone unneccsarily large with excessive bezels needs a reason (like waterproofness on a Sony). Looking at this rendering though (and it is a rendering, not an actual picture), I see that part of the seemingly huge top bezel is some sort of notification bar. As for the bottom, I hope there's capacitive buttons of some function under the physical completely-not-Samsung-Galaxy-like home button. Idk, four infra red sensors that allow 3D UI seem like a good reason to me. At least looks better than the S5. Design looks like a mix of Google Nexus 4 and Apple iPhone 5/5S. And a Galaxy home button. Amazon could sell this phone with minimal or up to 0 profit at all. Looks exactly like the iPhone leaks... a coincidence? People keep saying it looks like the N4 and 5s because they're going from recent memory. This phone actually looks like HTC Diamond from back in the day. I guess that may be where the inspiration for the N4 and 5s may have come from. As for the bezels, only tech geeks care about bezels. The average consumer could care less. Tech geeks aren't the ones who make or break a phones sales. The average consumer is the one who does that. I for one, don't mind bezels at all. Never bothered me or hindered my use of any device I use. Hmm... 720p 4.7 inch screen? Why u no 1080p??? This looks better than that prototype.... That some thought was the final product. looks like a galaxy made phone.